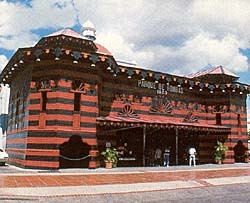 The Parque de Bombas de Ponce (Old Ponce Fire Station) was built as the main exhibit pavilion for the 1882 Exhibition Trade Fair. Architect Lt. Col. Maximo Meana of the Spanish Army designed the pavillion; he later served as Ponce's mayor. In 1885, the building was dedicated as Ponce's official firehouse--a function which it served for more than 100 years. The woodframe, Gothic structure exhibits a Moorish influence and is painted in bands of red and black. Today, the building serves as a museum honoring and commemorating Ponce's firemen. The Parque de Bombas de Ponce is located at the Plaza de las Delicias in Ponce, Puerto Rico. It is open 9:30am to 6:00pm, Wednesday-Monday. Call 787-284-4141, ext. 342 or 787-284-3338 for more information. The Parque de Bombas de Ponce has also been documented by the Historic American Buildings Survey.